Have a question for Galeum Guesthouse? "The kitchen/ lounge area is very clean and a nice place to chill as well!" 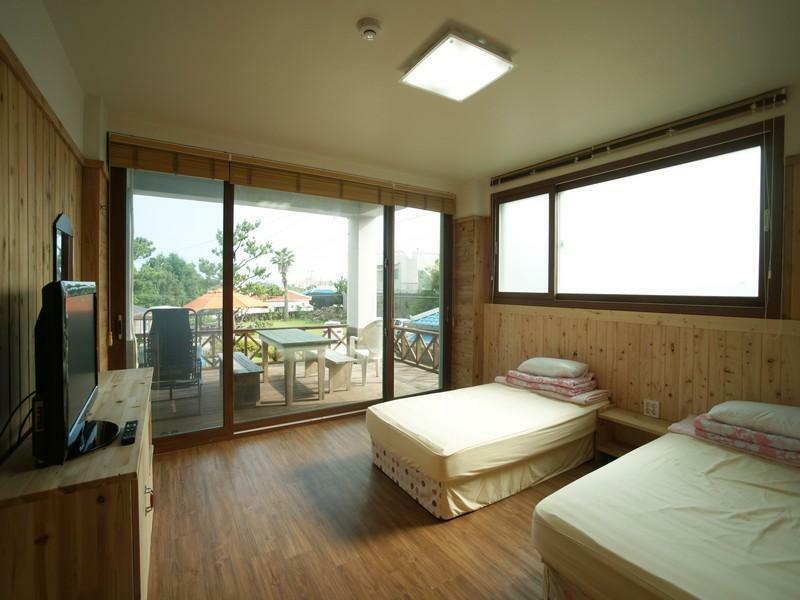 Galeum Guesthouse, located in Seogwipo, Jeju Island, is a popular choice for travelers. With its location just 7 km from the city center and 45 km from the airport, this 1.5-star hotel attracts numerous travelers each year. With its convenient location, the hotel offers easy access to the city's must-see destinations. Offering hotel guests superior services and a broad range of amenities, Galeum Guesthouse is committed to ensuring that your stay is as comfortable as possible. The hotel offers access to a vast array of services, including free Wi-Fi in all rooms, luggage storage, Wi-Fi in public areas, valet parking, car park. 10 rooms spread over 3 floors provide a warm and pleasant home away from home. Modern comforts such as television LCD/plasma screen, internet access – wireless, internet access – wireless (complimentary), non smoking rooms, air conditioning can be found in selected rooms. The hotel offers wonderful recreational facilities such as garden to make your stay truly unforgettable. Superb facilities and an excellent location make the Galeum Guesthouse the perfect base from which to enjoy your stay in Jeju Island. "Room is clean and comfortable." 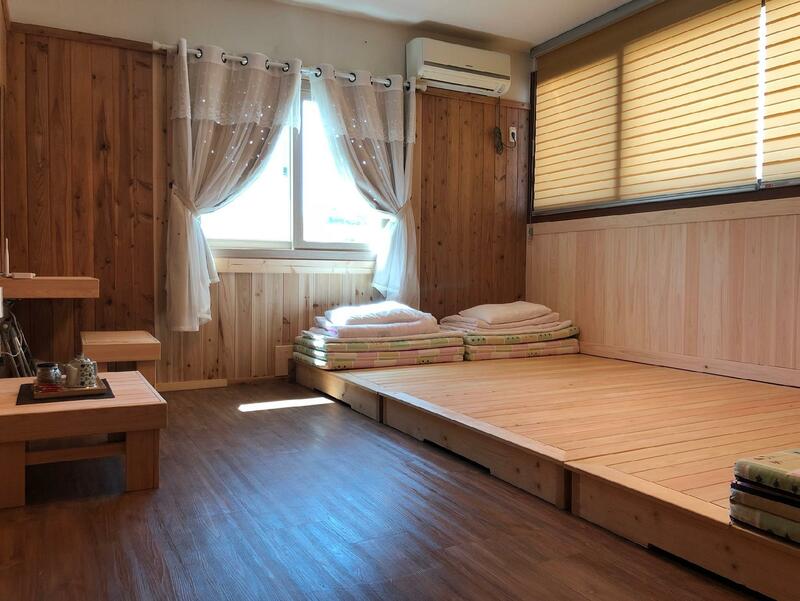 It is strategically located near Seogwipo World Cup Stadium and Inter city bus terminal. Near the beach and in a quiet neighborhood so if you are a light sleeper don't worry at night the area is quiet. Decoration is nice and the room is spacious. Value for money. Was greeted by a friendly staff in the evening. the view of the sea was good in the morning. Well managed facilities!. Probably one of the only guest house that have two bathrooms in a dorm room for six!! The kitchen/ lounge area is very clean and a nice place to chill as well! Highly recommend!! The guesthouse is tugged in a residential area, reached by navigating some narrow lanes. The rooms were nice and big. Breakfast was good. It's walking distance to the beach, with nice cafes and restaurants. I stayed 3 nights. My tire's car is flat. Staff is helping to contact call center of car rental company. I was grateful and appreciate. Room is clean and comfortable. Free breakfast is egg, milk and juices. Overall is good. 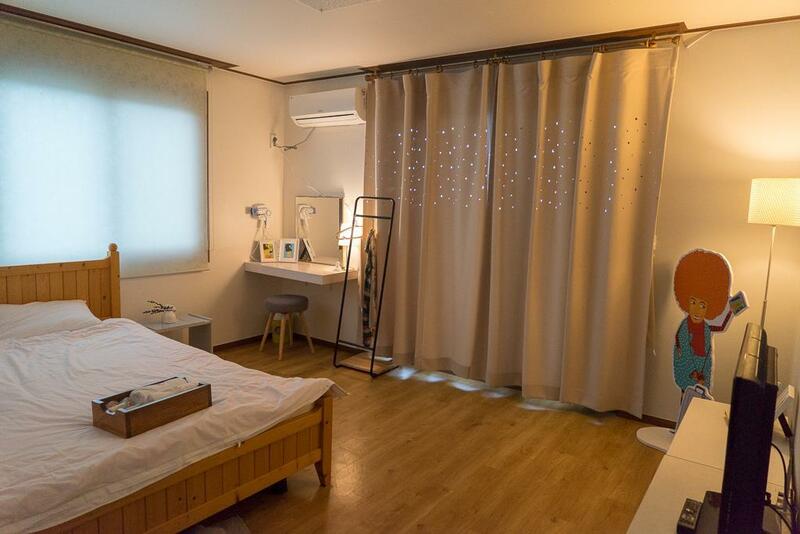 1.the staff here is very nice & kind 2.she can use english,which is better than most people in JEJU.3.room here is clean. The room is spacious and clean. The guesthouse comes with its own carpark, no parking fee. I stayed there for a night only and the hot water for shower is not very consistent. It was a pleasant stay. We loved our stay at Galeum. After a flight from Seoul and drove 1 hour from the Jeju airport, we were greeted by a lovely and cozy guesthouse. The owners are very nice, they speak limited English, but we can feel they are very sincere in making our stay pleasant. location. friendly staff. big room. satisfied with my stay at galeum guesthouse. although the bed is not very comfortable but still alright. the staffs are very friendly. location is good. if you are driving, and not a frequent driver, you might find it difficult to turn into its carpark and the road is quite narrow. other than that everything is good. Overall great guesthouse and good value. You're very close to the water and the view is great. Looking right at 'tiger island'. The neighborhood is quiet and a little isolated. However, its an easy bus ride/taxi to downtown Seogwipo only 10 minutes away. They don't make up your room but that's not a big deal. Breakfast was pretty good including toast, coffee, juice and eggs you can cook yourself! The couple working here are really friendly. The lady speaks English well. The rooms were more spacious than I thought, every room comes with a balcony facing the beautiful seaview. The family who runs the guesthouse is very welcoming and hospitable. They were more than helpful and they kept the place and rooms very clean. The amenities were satisfying, they have wifi, 2 laundry rooms as well as hangout room for guests to chill and have breakfast. The garden was very pleasant and they have parking spaces if you are renting a car in Jeju. The location was near the shore as well as the hosts were so friendly. You are able to make your own breakfast and they allowed us to cook our own food we bought locally. ~ Friendly and helpful husband/wife owners. ~ Very clean and comfortable accommodation. ~ Nice and quite location not to far tourist spots. From the moment i booked the guesthouse i enquired about arranging a taxi from the airport and scooter rental and they were able to arrange this for me. The husband and wife owners were very welcoming and sat us down to have a drink with them in the evening. The location is great as it is very quiet and peaceful and the view from the balcony is great. The rooms and very nice and clean making it a very comfortable stay. I would recommend hiring a scooter or car as it will be easy for you to get about to see many of the sites.